Click here for the new Mobile Interface Builder! 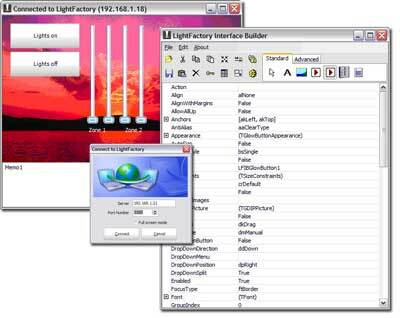 The LightFactory Interface Builder is a simple way to create an end user lighting controller. The editor window allows you to place and configure buttons, sliders, images, and other standard windows controls for an end user surface. Using this simple drag and drop interface you can build up the look and feel of the end user surface. Once created simply click on the "Create desktop icon" to provide an end user lighting controller. When run in end user mode the operator simply sees the interface you created. The LightFactory Interface Builder is now FREE with any license purchased. Connect as many interfaces as you want to a single LightFactory system. An option to provide feedback from the system. Build unlimited interfaces from a single registered system. Deploy as many interfaces to end users royalty free.